Austin City Limits, the 40-year-old Texas music and public television institution, has announced the formation of a Hall of Fame in conjunction with their 40th Anniversary, with an inaugural induction ceremony to be held on April 26th at the shows original home, KLRU’s legendary Studio 6A on the University of Texas campus. 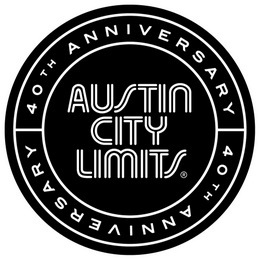 Inaugural inductees to the Austin City Limits Hall of Fame include Willie Nelson, Stevie Ray Vaughan and Double Trouble, University of Texas football coach Darrell K. Royal, and Austin City Limits creator, Bill Arhos. Darrell Royal and Stevie Ray Vaughan will be inducted posthumously. Performers at the initiate April 26th inauguration will include Doyle Bramhall II, Mike Farris, Buddy Guy, Emmylou Harris, Lyle Lovett, Lukas Nelson, Robert Randolph and Kenny Wayne Shepherd. Former University of Texas football coach Mack Brown will also participate in the ceremony, as well as other guests to be announced later. April 26th will also be when the details of the physical Austin City Limits Hall of Fame will be unveiled. Each inaugural inductee has a special tie to the Peabody Award-winning music showcase. Willie Nelson played on the very first pilot episode of the series on October 14th, 1974. The show was set up to be the video companion to Jan Reed’s marquee book on the Texas music scene, The Improbable Rise of Redneck Rock, to chronicle the unique music phenomenon transpiring in Texas at the time. A bronze statue of Willie sits outside the entrance of The Moody Theater where Austin City Limits is currently taped. Stevie Ray Vaughan is arguably the show’s most memorable performer, and a stalwart of the Austin, TX music scene. His shows in 1984 and 1990 are called by ACL, “the most iconic performances in ACL history.” The members of his backing band Double Trouble are also being recognized: Chris Layton, Tommy Shannon and Reese Wynans. In 1974 when PBS asked member stations to help produce original programming, the program director of Austin PBS affiliate (at the time called KLRN) Bill Arhos decided to prototype a program to feature the world-class music scene brewing in the city. After the successful pilot with Willie Nelson, Austin City Limits was green lighted, and the rest is history. Though Darrell Royal on the surface may seem like a strange pick for the Austin City Limits Hall of Fame, Royal was a big music lover and supporter of the Austin music scene, and was a friend to many of the artists, convincing performers like George Jones and Merle Haggard to perform on the show. He also inspired the show’s “songwriter specials” from the guitar pulls he used to host at his house. Chris Parton: Is it kind of a typical Friday night party song? Gilbert: Pretty much, yeah. We wrote it about the same kind of story as “My Kind of Party.” The day we get tired of Daisy Dukes, pasture parties and stuff is the day we are headed towards techno, and it’s time for me to step away. Great news and the inagural class is spot on. Will be intersting to follow in the oncoming years. Damn it never gets old hearing a little bit about SRV. He and his ACL performances are without a doubt probably the biggest reasons I picked up a guitar and learned. I was born in ’83 so when he was popular I was a little young. But, he and his music is probably the biggest reason I started playing 10 yrs ago and still play. So influential 20+ yrs after he’s been gone. So glad my Dad introduced me to his music.